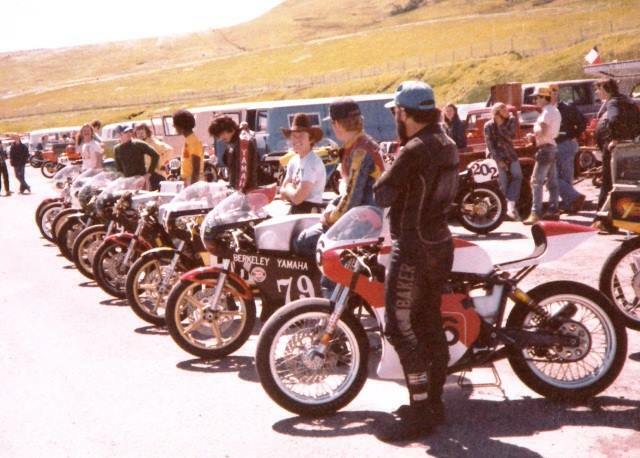 Recently a photo was posted to the “So Cal Retired Motorcycle Road Racers” Facebook group showing a line-up of race bikes with the DKG frame. That inspired this article (thanks Kendal Mullins). 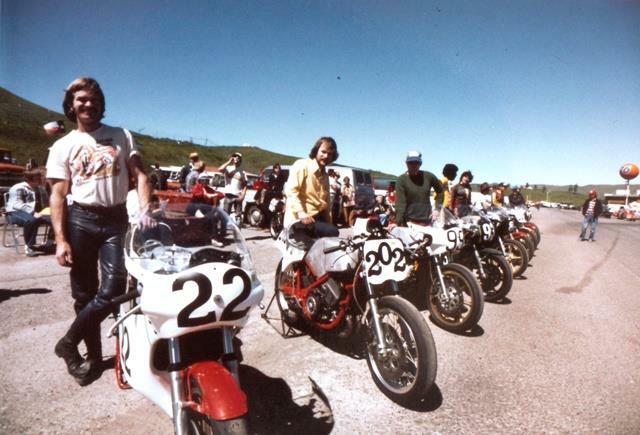 When I first started AFM road racing in 1973, one of the fast guys was a youngster named Dave Garoutte. He raced an Ossa, of all things, in the 250cc Production Class. For you youngsters out there, Ossa was one of the three Spanish makes along with Bultaco and Montesa. Ossa was best known for their off-road bikes, but they made a street bike too, a 250cc two-stroke single. Dave and I were pretty good pals at the track back in the mid-1970s, so I called him up and asked him about the frame and some other questions as well. Like many skilled racers, Dave moved up from 250 Production. He decided to race in the 250 GP class and bought a wrecked Yamaha TZ250-B. He tore the bike down and discovered the frame was bent. Dave was working at Kosman Specialties at the time so he had access to some good tools and equipment, and he straightened the frame. After getting a good look at it Dave realized the stock Yamaha race frame was basically a modified street frame. Dave added some bolt-on tubes to stiffen the frame. “Why bolt-on, why not welded?” I asked. “They needed to be removed to get the engine out,” Dave explained. 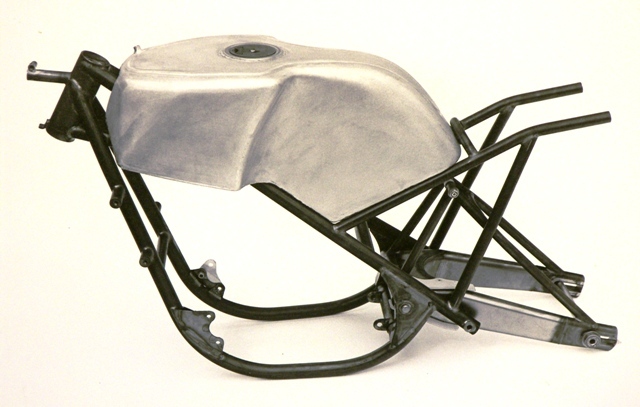 Looking at the existing frame and engine, Dave realized that he could make a frame with straight tubes connecting the steering head and the swing arm pivot and still be able to pull the motor when needed. That change did the trick, and Dave found himself with a TZ250 that handled noticeably better than the standard ones. He decided to build a batch of frames and see what happened. He built 10 kits; each kit included the frame, a fuel tank and a very stiff swing arm. The kit featured oversized (for the time) tubing in a straight load path from steering head tube to swing arm pivot, tapered roller bearings in the steering head, and a formed double tapered swing arm with tapered roller bearing pivots. With the standard TZ250 fork and wheels the frame gave a short 51-inch wheelbase for quick handling. It was also very light. Weight depended on added equipment, but Dave’s own bike weighed 225 lb. without gas. Dave’s complete bike. Photo courtesy of Kendal Mullins. Dave describes the bike as “super responsive and predictable.” He could slide it through turns with ease. He told me he only high-sided once, in Sears’ turn 7 hairpin. “I was drifting through the turn as usual, but my front wheel touched one of the curb bumps on the inside of the track.” With the front wheel unable to advance the bike spit him off (Sears Point eventually replaced the individual curbstones with a more conventional smooth raised curb). All 10 frame kits were snapped up by local S.F. Bay area racers. In 1980 nearly all of the DKG-framed bikes were at a race at Sears Point so they lined up to give folks a photo opportunity. Photo courtesy of Kendal Mullins. From front to back in this photo is Jack Baker, Doug Draper, then Glen Shopher (in the cowboy hat). Next is Mike Canepa (with the word “Yamaha” on his arm) then John Williams in the Yellow t-shirt, Mike Ross with the green shirt and blue hat. Right behind Mike is the late Bill Smith of Smith Machine and Quandry, the owner/tuner of bike 202 (rear wheel visible just to Jack Baker’s right) with rider Bob Runyon. Finally, at the very end is Bill Brinckerhoff. These guys won races. Draper was the AFM #1 rider in 1977 or maybe 1978. You can read about John William’s racing career on page “YY. The Berkeley Burner” in this blog. (https://paulritterblog.wordpress.com/the-berkeley-burner/). Brinkerhoff was the AFM’s 125 GP class champion before moving up to the 250 class. Note that bike 202 is not a 250cc GP class bike. One of Dave’s frames was sold to Bill Smith of Smith Machine and Quandry. 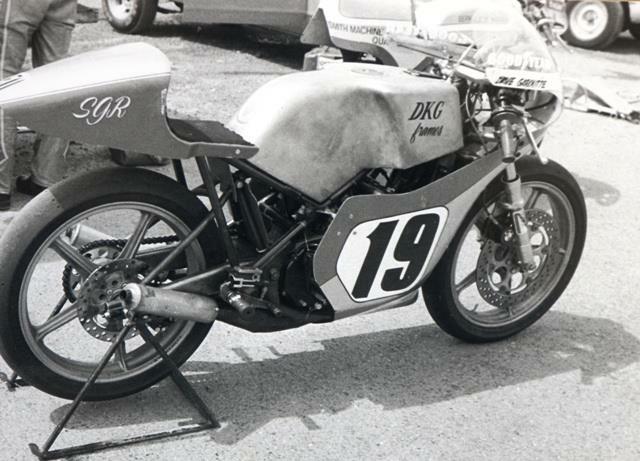 Smith modified it slightly and installed a highly tuned RD400 motor, then asked Doug Draper and Dave Garoutte to race it in the 1980 Ontario 6-hour. The team finished 7th overall, first in the 500 class and beat all of the 750’s. The calculated top speed of the bike at this race was about 150mph at the end of the long front straight. In 1978 Garoutte had opened his own shop, DKG. (http://www.dkg-cnc.com/). He has done work for Mert Lawill and Bruce Hammer, was in at the start of the mountain bike development and was active for a while in “mountain bike politics” in Marin County. Check out the Museum section of his web site to see some of the projects his shop has taken on in the past. “I always enjoyed working with my hands. I had a job right out of high school,” he told me. As his shop nears its 40th anniversary, I think he still does enjoy working with his hands. Dave’s frame project shows what an individual with a good idea, some high end tools, and a little help from friends, can accomplish. Great article Paul! Dave was also a national level expert racer in those days a stalwart on the Marin County Sunday Morning Ride. I’m curious if anyone wonders why all these bikes have the letters “SGR” on them? I remember Dave…also very fast on the bike (maybe the “K” is for kwick). One time there was a party for the Solid Gold Racers and a question was asked “What does BOLT ON mean”. Dave came up w/ the best answer “bolt on mill, bolt on lathe”. I got my DKG from Tom Bieshiem, one of the best aftermarket fames you counldn’t get. Larry, I still have that questionnaire I came up with. I’ll have to pull it out and scan it. I was fortunate to have some great friends and super fast racers in the SGR Team! Hi Paul, I believe I own Bill’s old 202 bike. I’m in the process of rebuilding it with a hot RD350 setup. I didn’t see many people with stopwatches back then. Just for the record, I timed Dave on his Ossa 250 at 2:06 at Sears; good enough to battle for the lead of 350 production. 1975 predated DMV rules. My guess is that there was no such thing as a production exhaust for the Ossa, and Dave did some tuning. I thought motorcycle frames were almost barbarically crude back then. I did not realize I might be the only person who spend years taking courses so I could do things like determine torsional stiffness of none-circular tubes using pencil and paper (you need to use imaginary numbers). Wish I had taken some welding and fabrication courses. My XL350 ran rings around RDs in the corners. Honda was worried about vibration causing cracks in frames in their first large single. So the XL350 had a 45 pound frame, the same as a Norton. A hefty fork brace helped tame the fork. In 1976 my department bought an HP computer with 5700 bytes of ram. I wrote a program to simulate going around a race course. At Sears a 10% increase in traction would decrease lap time by 5 secs, while 10% changes in power and drag changed lap times by 1 second and 0.5 seconds. Did I buys slicks? No!, I spent my money on pumping up my engine and repairing it. And slid around on worn out tires. Great article. .. In effect, slightly later version of of the Yamsel frame that Colin Seeley built for UK short circuit ‘scratcher’, John Cooper.